The French playwright, Jean Anouilh pointed out the obvious. “Things are beautiful if you love them.” And if you love Peonies, the time to view its beautiful blossom is now. However, transplanting or planting Peony root stock should always be done in the fall. Trust me. I tried an early transplant this spring, knowingly breaking the rules. Well, it isn’t pretty watching it struggle in its new spot. Some plants are crankier than others about an ideal moving date and Peonies fit that category. If you want these long-lived herbaceous perennials to thrive, it also requires a waiting period. To help the plant establish its crown, you should remove the flower buds for the first two to three years of growth. That’s a tough one, especially for those of us that expect and want those big Peony blossoms immediately. The depth of the planting is also critical. 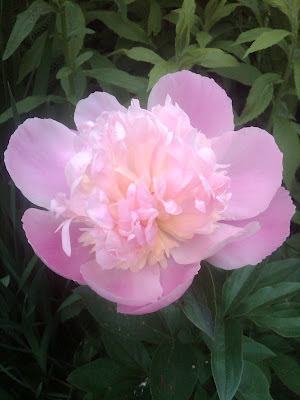 Simply put - follow the Peony rules for beautiful bloom. With so many choices to be had, including self-supporting intermediate varieties (a cross between tree and garden peonies) or the dwarf and Alpines (miniature versions of the standards), it’s hard to contain yourself from a Peony collection. Just follow the Peony rules to produce beautiful bloom!